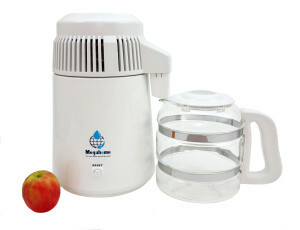 Megahome countertop water distillers make water purification easy and cost effective. Simply fill the stainless steel boil chamber with water and press the start button. The water distiller will shut itself off automatically after one gallon of pure steam distilled water has been collected in the glass collection pitcher. The distillation process takes about 5.5 hours. 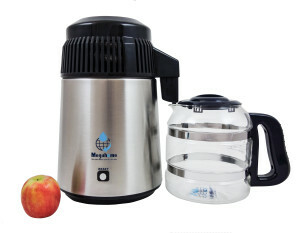 Produces up to 4 gallons (16 litres) of pure steam distilled water per day. Durable build, superior construction and materials. Stainless steel boil chamber, dome and condensing coils. Automatic temperature control and shutoff. Certified by UL, CSA, CE, CB, and GS. Warranty: Full One Year, Parts and Labor. Note: This distiller model is NOT designed for the distillation of alcohol or essential oils. Steam distilled water can be 99.9% pure if followed by carbon filtration; only oxygen and hydrogen molecules end up in the finished water. Minerals, heavy metals and other impurities are left behind. The post carbon filters are used to adsorb unwanted gases that may have passed through the distillation process. Distilled water has a neutral pH of 7. Distilled water interacts readily with natural atmospheric gases which may then cause its pH to drop to below 7. Does distillation remove beneficial minerals? Yes. It’s a trade-off. Distillation can produce pure water; only hydrogen and oxygen remain. When combined with carbon filtration, the distillation process will kill and remove virtually 100% of bacteria, viruses, cysts, as well as, heavy metals, fluoride, radionuclides, particulates, inorganics and non-volatile organics. Healthy minerals can be re-introduced after your water has been purified. Find out how here. Will distilled water leach minerals from my body? Distilled water does not leach out minerals that have become part of the cell structure. It does attract minerals that have already been rejected or excreted by the cells. Many health aficionados choose to drink distilled water because of its purity and because it has added power to draw toxic waste out of the body. Distilled water is also excellent for rinsing skin and hair. Does distilled water taste bland or ‘flat’? Every water source has unique characteristics which determine the taste of that water. We become accustomed to the taste of our local water supply and may need time to acquire a taste for water from new sources. The same is true of distilled water. It is not ‘flat’ tasting except by comparison with a mineral or chemical-laden water. Distilled water from a Megahome countertop distiller tastes delicious, clear and light. Does distillation remove VOCs and organic chemicals? No. VOCs are volatile organic compounds. In a distiller water is boiled to 212°F in the boiling tank. The vaporization process that occurs inside a distiller will remove salts, metals, and micro-organisms however the boiling point of most synthetic chemicals (including pesticides, herbicides, and many chlorination by-products) is lower than the boiling point of water. If these chemicals are present in the initial water, they will vaporize with the steam and pass through the distillation process. For this reason it is very important to use and frequently replace the carbon filters which are used with water distillers. The carbon adsorbs and removes VOCs and unwanted gases. What maintenance does a distiller require? Carbon filters should be changed out at recommended intervals. Residue left over from the boiling process should be drained periodically. In hard water areas, heavy scale that builds up in the boiling tank will need to be removed using citric acid or a scale cleaner. In soft water areas such as Metro Vancouver, this build-up removal will not be frequently required. Can the MegaHome distiller remove cyanobacteria or microcystins from a contaminated water source? Yes. Microcystins are a genus of Cyanobacteria. They are a toxic particulate that is removed in the distillation process. Boiling is not effective against Microcystins because they are resistant to a wide range of temperatures. Boiling actually concentrates the toxin. Distillation, on the other hand, is the process of boiling water and capturing the resulting steam that rises. The steam leaves behind the contaminants, including bacteria and resulting chemicals, such as Microcystins. In North America the average person uses more than 650 litres of water per day.